- Repost - My most viewed Image on Flickr. 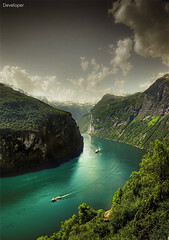 This is Geiranger Fjord in Norway my friends. When you stand up here and look out to summits and the fjord, its like God is calling you for a short visit to paradise.